The Indonesia Business Council for Sustainable Development (IBCSD) convened high-level meeting on building commitment and collaborative actions for green lifestyles for sustainable consumption and production at Mercantile Athletic Club, Jakarta on 31 January 2019. 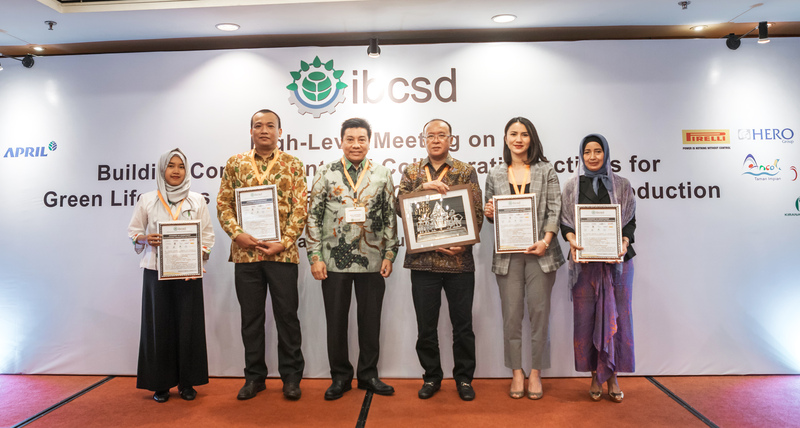 This event marks the conclusion of the IBCSD-supported series of activities on promoting green lifestyles for responsible consumption and production in Indonesia. Companies operating in Indonesia, at least 13 companies, made declaration of commitment to support the implementation of sustainable consumption and production. More than 100 participants from various stakeholders: government and non-government partners, private sector, development partners and academia participated in this event. Chairman of IBCSD, Sihol Aritonang, in his opening speech shared major conclusion from the IBCSD-supported study on green lifestyles program. “From private sector perspective, sustainable consumption and production like two sides of the same coin can be achieved by two collaborative movements: equipping the capacity of the internal supply-chain to adopt sustainable principles (upstream level) and educating consumers to choose ‘green’ products (downstream level)”, said Sihol Aritonang.